Hello readers! Vince here with another late card review! This time, I’m looking at Plusle (Shining Legends 33/73). 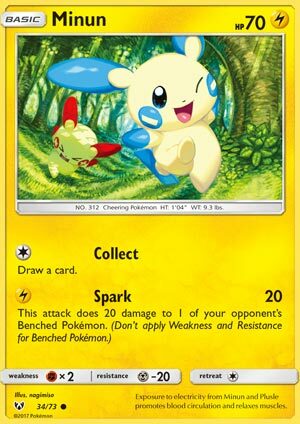 It doesn’t seem like much, but out of all the Plusle cards in Expanded, this one is the most aggressive, but more on that later. Being a Basic is the best stage due to being put into play easily and saving deck space as opposed to Evolutions. Being a Lightning type means it can hit certain Pokémon for weakness that represents the flying type in the video games. It would be ridiculous if I were to say that Lightning weakness can be found on Grass, Fire, Water, Lightning, Colorless, Psychic, Metal, and Darkness Pokemon because that’s where such weakness are found in those types of cards. Lightning resistance, however, can be found on Black & White-era cards. Weakness to Fighting is unfortunate, but with 70 HP, it may seem like overkill for those hitting triple digit numbers, but that suddenly means small attacks can have a chance of KOing it. Taking less damage from Metal Pokemon is helpful unless its attacks already reach OHKO territory. And a retreat cost of one can be easy to pay and easily shaved off by Escape Board. Plusle only has one attack called Tag Team Boost, which costs L for 10 damage. If you have Minun in play, then this attack does 50 more damage. This is a sizable boost, and provides early game pressure that can put a dent on what’s Active, possibly OHKO or 2HKO when Weakness cooperates. This attack, before factoring any boosts, can already OHKO Night March and Shaymin-EX. With Choice Band ramping Tag Team Boost up to 90 damage, you’re already 2HKOing most Basic EX/GX Pokemon. Additionally, the upcoming item card called Electripower can be used as many times as you like; for each use, your L Pokemon does 30 more damage to the Defending Pokémon. Eventually, Plusle can OHKO any Pokemon in the game. It’s scary that such a cute rodent can achieve very high numbers, but remember that a LOT of investment would have to be made to achieve this. Without constant one-time boosts like Electripower, you can only hope to doing 90 damage at best, which is still good value for one Energy, though you may have to look elsewhere if you want to deal even more damage. 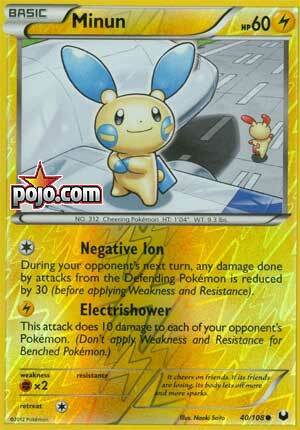 Because you need a Minun in play to trigger the damage boost, you might wonder which Minun to use. For Standard options, you have two options: Minun (Shining Legends 34/73) and Minun (SM Celestial Storm 54/168). Unless circumstances change, those four Minun options are all Basic Lightning type weak to Fighting and a retreat cost of one. The Shining Legends print has 70 HP, Metal Resistance, and two attacks. Collect costs C and draws one card. Spark costs L and does 20 damage to the opponent’s Active Pokemon and 20 damage to one of your opponent’s Benched Pokemon. The Celestial Storm print has 70 HP, Metal Resistance, and two attacks. Ditch and Draw costs C and lets you discard any number of cards from your hand and draw cards until you have five cards in your hand. Electro Ball does 30 damage for LC. For Expanded, you have two more options: Minun (BW Dark Explorers 40/108, BW Legendary Treasures 48/113) and Minun (XY Furious Fists 32/111). The Dark Explorers print has 60 HP, no resistance, and two attacks. Negative Ion costs C and lets Minun soak 30 damage. Electrishower costs L and does 10 damage to each of your opponent’s Pokemon. The Furious Fists version has 70 HP, Metal resistance, and two attacks. Negative Discard costs C and functions like Energy Retrieval; Put 2 Basic Energy cards from your discard pile onto your hand. Static Shock costs L for 20 damage. With all Minun options explained, which one is better? I guess it depends. The Dark Explorer print has a nice spread attack while the Shining Legends print hits two targets harder. Both suffers from possible opposing Pokémon’s Bench protection, limiting those attacks’ effectiveness. The Furious Fists print should not be used due to an Energy Retrieval doing the same thing without having to use an attack. The same can be said for the Celestial Storm print as there is an upcoming Supporter card called Sightseer that does the same thing Ditch and Draw does without using up an attack. I did not discuss other Plusle cards because the focus is the Shining Legends print, and that you’ll run 4 copies of such cards. So how do you use Plusle? Pretty easy actually! With a deck that runs very fewer Pokémon and energy cards, there’s a lot of room for trainer cards. For what I personally made for an Expanded Plusle deck, I had 4 Plusle, 3 Minun from Dark Explorers, one Oranguru for draw power, and one Tapu Lele-GX for fetching a Supporter card. I also put 10 Basic Lightning energy. That leaves room for 41 trainer cards! Volkner would be a staple in this deck, because it fetches a Basic Lightning energy and an item card. Electripower is for damage boosts. Fighting Fury Belt for more damage and HP. Aether Paradise Conservation Area for Lightning and Grass Pokemon taking less damage. Thunder Mountain for shaving off attack costs by L! Nest Ball to summon one more Basic Pokémon. Revive for putting a Basic Pokémon from the discard into your Bench. Sycamore, Cynthia, and N for draw power. Field Blower for Tool and stadium removal. And possibly much more! So what’s holding Plusle back from being competitive? Low HP is one of the reasons, as well as some anti-Basic cards that can hard counter them such as Jolteon-EX and Pyroar. You might be stuck with cards that might not be the right time to use. Putting the shortcomings together, we’ve got a Pokémon which does a decent job that you might get at least one deck that focuses on Plusle and might have a chance of winning a match, but not consistently enough that you shouldn’t take such a deck to bigger tournaments. As such, this means that Plusle is used for fun and not too seriously. 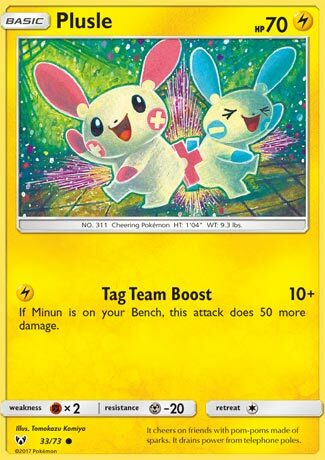 In Limited, assuming they held tournaments that uses that expansion (which didn’t happen), Plusle and it’s set mate Minun are labeled as common rarity, making it easier to pull. While it can do good damage for one Energy, other big basics have no trouble taking Plusle down. Some counters include, but not limited to, Reshiram, Zekrom, and Mewtwo GX. Conclusion: Plusle may not look like much, but with existing and future type specific support, those may break what would be an underpowered card.